DIY Halloween Character Molds Kit 18 Spooktacular Creations to Bring to Life or Back From the Dead. Mix, cast, and create ghoulish Halloween characters! Kids will enjoy learning the basics of casting art with plaster. 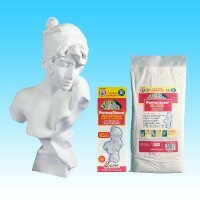 Easy-To-Mix Plaster As a specially formulated art supply grade plaster, Sandtastik® PLASTERMIX Plaster of Paris Casting Material is easily activated by using 2 parts ..
Instamold allows you to mold the object of your choice fast and accurately. It is non-toxic and safe for skin when making craft projects such as body parts. . Instamold can be used on any three dimensional object. 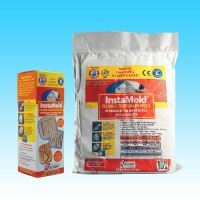 You can use Instamold with wax, plaster, Permastone and resin! Instamold is the perfect mold-making material for craft projects such as custom-designed pottery pieces or cherished hei..
Activa Permastone mixes easily with water and reproduces the finest detail. Permastone is the ideal casting compound when permanent break-resistant castings are desired. It handles like plaster and has a stone-like finish. Even if it happens to break the fracture is clean and easily glued/fixed. It can be painted as it dries white with acrylics, oils, watercolors, tempera or any other fin..
Magic Color Plaster Casting Kit Just add water to make the color appear! The reusable mold allows for more than one casting to be made. After the craft project is made it can be finished by decorating it with your favorite paints, glitter or colored markers. 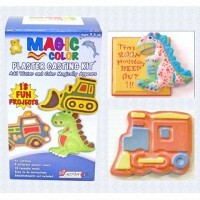 Set contains 18 exciting reusable molds that are perfect for boys such as dinosaurs or automobiles. 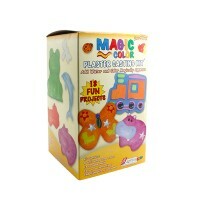 Kit Contains: 8 d..
Magic Color Plaster Casting Kit Just add water to make the color appear! The reusable mold allows for more than one casting to be made. After the craft project is made it can be finished by decorating it with your favorite paints, glitter or colored markers. Set contains 18 exciting reusable molds that are perfect for boys and girls camp activities. 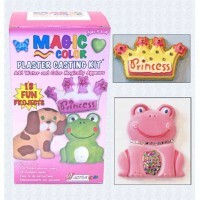 Kit Contains: 8 different plaste..
Magic Color Plaster Casting Kit Just add water to make the color appear! The reusable mold allows for more than one casting to be made. After the craft project is made it can be finished by decorating it with your favorite paints, glitter or colored markers. Set contains 18 exciting reusable molds that are perfect for girls such as butterflies or hippos. 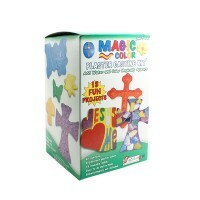 Kit Contains: 8 dif..
Magic Color Plaster Casting Kit Just add water to make the color appear! The reusable mold allows for more than one casting to be made. After the craft project is made it can be finished by decorating it with your favorite paints, glitter or colored markers. Set contains 18 exciting reusable molds that are perfect for holiday ornaments and keepsakes. 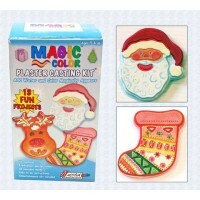 Kit Contains: 8 different pl..
Magic Color Plaster Casting Kit Just add water to make the color appear! The reusable mold allows for more than one casting to be made. After the craft project is made it can be finished by decorating it with your favorite paints, glitter or colored markers. Set contains 18 exciting reusable molds that are perfect for bible school activities. 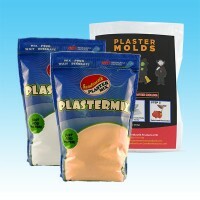 Kit Contains: 8 different plaster color..